Update: This offer is no longer available. Check our Hot Deals for the latest offers. There’ve been a lot of new credit card offers this week, including the 100,000 Citi Executive card and the $250 American Express SimplyCash card after completing the minimum spending. But here’s another one, via The Points Guy. You can get 40,000 Alaska Air miles with the Alaska Airlines credit card after spending $10,000 in 6 months! Update: It looks like the last 15,000 miles is only if you’re an Alaska Air elite member! This is a great offer for 40,000 miles! Alaska Air recently had an offer for 50,000 miles, but that lasted only ~2 weeks! But note that Bank of America may approve you for a different version of the Alaska Air card and give you less than 40,000 miles. Also note that you don’t get the extra 15,000 miles if you’re approved for a Platinum Plus or Preferred card. I really don’t like it when banks reserve the right to give you fewer miles, but don’t tell you upfront which offer you qualify for! There is a $75 annual fee which is not waived with this offer. And there is a 3% foreign transaction fee so you shouldn’t use it outside the US. This 40,000 miles offer may be targeted because the landing page suggests that it is only for Alaska Air elite members. MissMiles points out that the terms SPECIFICALLY mention that the last 15,000 miles are only for Alaska Air elite members. So even if you apply and are approved, it is possible that you may not get the bonus miles if you were not targeted. But I don’t know how long this offer will last. The offer also states that it’s for new customers only. In practice, many folks get the bonus again on Bank of America cards. 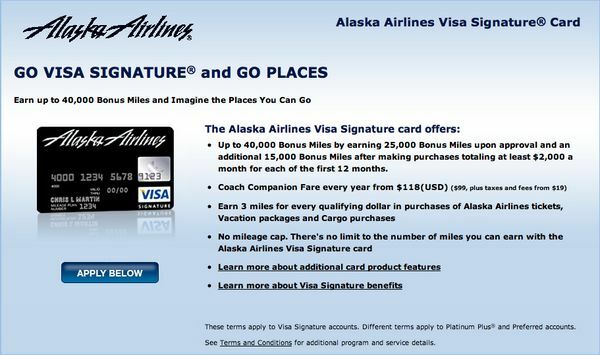 How to Use Alaska Air Miles? See this post for 10 ways to use Alaska Air miles! This is a pretty good offer for 40,000 Alaska Air miles. I like that you get 25,000 miles immediately, but have 6 months to complete the $10,000 minimum spending requirements for the remaining 15,000 miles. But be careful, because the terms suggest that you get the last 15,000 miles only if you’re an Alaska Air elite member. My husband has elite status so he signed up. No email or anything confirming. But got a litter and today 25k showed up in his account. Might not even do the spend not sure it’s worth is since he has a lot of Alaska miles anyway but just FYI for people! @do it–wish I would have seen your message about the fee waiver, didn’t think to ask for that and they didn’t offer it to me. So, just as a data point. I got the 30k offer in my email shortly after I applied for the regular 25k offer and was instantly approved. I called to try to match but they had me apply for a second card. Just got a call from a credit analyst who approved me for the second personal signature card. Applied for a business card on the same day so I should end up with 80,000 Alaska miles with the upfront annual fees for the cards. Not a bad tradeoff I think. BOA also suggested that I apply for a second card when I asked to be matched to a better offer and they even removed the annual fee on the first. In the end, I kept the bonus of the first offer + the higher bonus of the better offer and only one annual. And all of it thanks to Daraius.